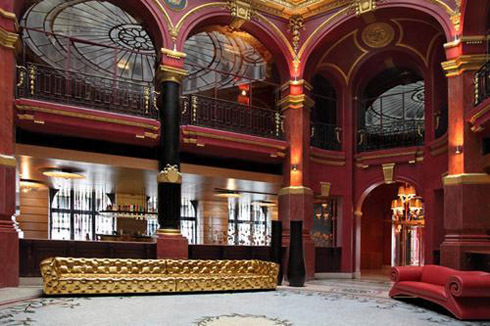 The Hotel Banke is the ideal location to enjoy Paris – the City of Lights – in France. The Hotel Banke is located in the 9th arrondissement, in Paris’ Opera area on Rue La Fayette. The hotel is in the heart of the Grands Boulevards quarter, close to the Place Vendôme and just ten minutes from the Louvre. The Hotel Banke has been billed as “an exciting blend of the historic and the avant-garde of fabulous Paris, and just a short walk from the magnificent Place Vendôme and Rue Faubourg Saint-Honoré. The hotel is housed in the former headquarters of CCF Bank (a classic Belle Époque building). The Hotel Banke is part of the Derby Hotels Collection, and has been beautifully restored for its new life as an urban resort. The Banke has 93 rooms, some with panoramic views of amazing Sacré Cœur. For a small boutique hotel, the facilities seem quite expansive, including: two restaurants (one of which is gastronomic), a night club, a spa zone and gym, and art collection displayed on every floor of the building, showcasing art from all cultures and historic periods. Fully soundproofed, hotel guest rooms are outfitted with all the latest technology: LCD television with 250 satellite channels, wi-fi, and individual air-conditioning and temp controls. Hotel Banke guests can also take advantage of 24-hour room service, late breakfast served until 1 p.m. in the bar, and limo service around town.